This stunning mosaic in small, colourful vitreous glass mosaic tiles is supplied as Framed Mosaic Wall Art, hand made in the UK. Home Studio crafted onto a waterproof board edged with aluminium, fully tiled and grouted, this Limited Edition mosaic art will brighten up walls inside or outside. It is made from 6,102 tiles in 36 colours, with a nominal size of 595mm wide x 1244mm high (approx 23 x 49 inches). Packing and Delivery to most of the UK Mainland is included in the price, with no VAT to pay. Although this shop is for UK customers only, this mosaic design can be shipped to Europe, USA, Canada, Australia and other countries - order online at Hinomaru Koi on Kaamar.com (or if you prefer, use the quote button on the right to ask for a quote). The thumbnail on the right shows the mosaic design at 1 pixel to 1 tile, without grout lines. 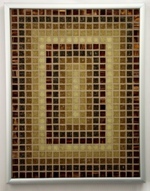 This mosaic art is also available to buy online in "Mosaic Tile Art" form. This mosaic design is Copyright © 2010 Kaamar Ltd, based on an original photograph Hinomaru Koi by merec0 under CC BY 2.0 licence. The original of this image shows the mosaic design at approx. 1 pixel to 1.5 mm, including grout lines and tile colour blocks (see the colour note below) but has been adjusted in size by your browser to fit on the page, blurring the detail. You should see a grid of coloured squares representing the tiles, with sharp coloured lines between representing the grout lines, but sometimes your browser may not scale the design very well at some zoom/scale factors, either blurring the lines, missing some lines out or showing them at differing thicknesses. IE(9+) is particularly poor at downscaling mosaic images, so shortly after page loading the picture may be replaced with a lower resolution version. To see the original, click on the picture which should open the mosaic design at original size in a new browser window or tab. You can then use the scrollbars and your browser's zoom function to view the design - you can always save the original picture to your computer to view in your imaging software. Suitable for Homes and commercial premises such as Offices, Restaurants, Pubs and Hotels. Suitable for all typical rooms, including Kitchens, Bathrooms, Wet Rooms and Swimming Pools. No of Tiles: 6,102 tiles (54 wide x 113 high) in 36 colours. Tiles: vitreous glass tiles, each 10mm x 10mm x 3-4mm deep. Mosaic Size: 595mm x 1244mm nominal (approx 23 x 49 inches). Mosaic Area: 0.740 square metres nominal. Overall Size: 605mm x 1254mm x 36mm approx. Grout Colour: Light-Medium Grey ("Manhattan Grey"). Our objective is to bring the beauty of mosaic art into more homes and offices than ever before, by offering a wide range of affordable designs available in a choice of formats and sizes. To this end we have invested extensively in computer assisted mosaic design technologies, developing our own specialist algorithms and methods to optimise the selection of tile colours. Our mosaic designs use the traditional "Opus Regulatum" style of tiles laid out in a regular pattern, like squares on a chess board. Our "Framed Mosaic Wall Art" is prepared using the "Indirect" method, where tiles are first laid out in the design and attached by their top face to a removable transparent film. The sheets can then be pressed, tiles down, into the tile adhesive, transferring chunks of the design in one go, maintaining the tile layout. Once the tile adhesive is set, the transparent film sheets can be easily peeled from the tiles. With the film removed, the tiles can now be grouted to complete the mosaic. All our mosaic designs are specially 'Made to Order' - once your order is received we will maintain ongoing contact with you, to review/check your requirements, update you on progress, advise you on delivery etc. This mosaic design is also available with other grout colours and delivery options - see Hinomaru Koi on Kaamar.com (our international site with advanced mosaic design features). Custom mosaic designs are readily available, based on your own image or art work - upload your own picture at Kaamar.com to create your own mosaic design online. A sealed, lightweight, stable and waterproof backing board. Edges strengthened, sealed and protected with Architectural Aluminium 6063T6 section. A top quality, high performance and deformable, frost proof and waterproof, White adhesive classified C2FT S2 to EN12004. A top quality, high performance and flexible, anti-mould, frost proof and waterproof grout, classified CG2 to EN13888. The backing board comes pre-fitted with hanging rails which, when used with the heavy duty brackets provided, allow mosaics to be flush mounted against a wall. The colours shown are for guide use only. It is impossible to give an accurate indication of the finished mosaic colours: the tile colour shades vary from batch to batch, supplier to supplier (as is common with all fired glass). Most have a speckled appearance, with very small white(ish) specks and bubbles, that affects the colour shade when seen from a distance. Vitreous tiles are semi-transparent/translucent/reflective, which varies in extent from colour to colour, so the colour shade seen is also affected by lighting conditions, adhesive and grout colour, etc. Finished grout colours will also vary due to mixing, texture, application or batch variations. These factors make it very difficult to match a tile or grout colour to an accurate computer colour definition. Even then, the colour you see on your screen may not be exactly the same as we see on our screens, due to differences in browser, display and screen settings. We have gone to great lengths with our design images to indicate reasonably realistic tile/grout colours based on the colour impression from a distance under good light, when fixed with white adhesive and (for the tiles) a light-medium grey grout. As with all mosaics, the artistry is in the overall picture impression, rather than the specific use of colours. This is a Home Studio crafted product. Every due care and attention is taken to ensure a high quality product with a professional finish. However, as with any Home Studio crafted product more minor irregularities are to be expected than for a mass produced factory item. Many of the tiles (despite their factory manufacture) have slightly varying shapes, irregular edges or minor edge chips. As part of our quality control procedures, all tiles are visually checked prior to product assembly. Some irregular edged tiles can be ground back to shape, while broken, deformed, excessively chipped or irregular edged tiles are replaced. The corner joints of the aluminium edging, while fairly discreet, are not as perfect as a factory produced item. Tile mounting and grouting are carried out by hand, inevitably resulting in minor variations in tile positions, depth and orientation, grout lines etc. Such variations and irregularities only add to the artistic charm of our completed mosaics. This product is 'Made to Order', as one example of a fully customizable mosaic range. Our fully customizable mosaic range offers a virtually infinite combination of designs, sizes, colours and formats, so all 'Made to Order' goods are personalised to your custom specifications, whether or not they match one of the example products shown on this website. As such, if your order contains 'Made to Order' goods you do not have a legal right to cancel your order under The Consumer Contracts Regulations 2013. Standard Delivery is Free to most of the UK Mainland including remote areas, with the exception of the "Scottish Highland" postcodes: IV, KW1-14, PA34, PA37-39, PH19-40, PH41 sector 4, PH49-50. For delivery to other countries, to the rest of the UK including excluded remote areas or if you require additional delivery options such as Saturday/Next Day/Before 10am/Collect please order online at Hinomaru Koi on Kaamar.com. 'Made to Order' typical dispatch: 3-5 working weeks. Typical transit time: 1-2 working days. Current selling price valid until 22/04/2019. On 22/04/2019 (after 6pm UK time) the price will be reviewed - it may stay the same or change. This product was added to our catalog on Tuesday 24 August, 2010. Send mail to webmaster@kaamar.co.uk with questions or comments about this web site.